Ratish Abraham is a progressive musician and educator from India with over 15 years of teaching experience. He first taught in a private school in Bangalore, where he has been teaching students in a classroom setting. Ratish then ventured to train students in a private, more focused, and personalized-approach setting. He recognizes the need for stylistic teaching that caters to various forms of individualistic creative education. Seeking every student's’ personal goals, interests, and strengths, Ratish develops a strong theory-based lesson plan to help his students reach their artistic goals and enhance their knowledge. 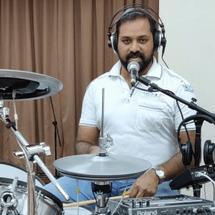 Among other achievements, Ratish has been featured in TV programs like SS Music & Spice Jam as a drummer & backing vocalist for a progressive Rock band “Parousia”, a band based in Bangalore doing shows both in the country & in the Middle East.